Come February and Bangalore looks its best with the flowering trees bursting with blooms blanketing the city with a riot of colors attracting bees and hummingbirds. It is spring, a season which has inspired great poets since time immemorial and a season loved by all. 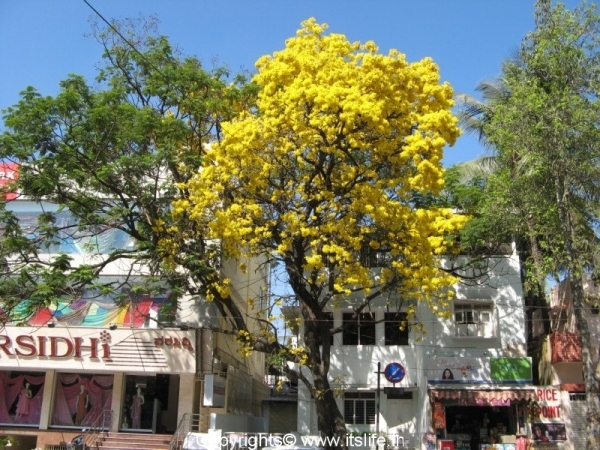 A yellow flowering deciduous tree known as Tabebuia Aurea dots the city catching everyone’s attention with its deep colored branches supporting huge yellow flower clusters. 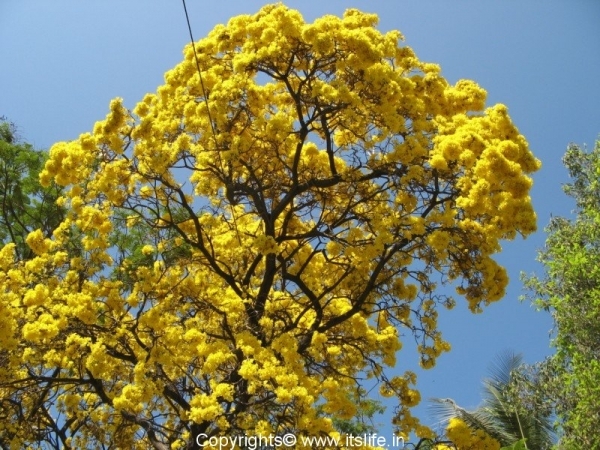 This tree is also known as Caribbean Trumpet Tree, Yellow Tabebuia and belongs to the Bignoniaceae* family. A very easy to grow tree, Tabebuia Aurea tree grows to a height of 15 to 30 feet tall. It can be grown in smaller containers as a bonsai. The leaves of this tree are narrow and elongated. The tree blooms from February to April. The leaves fall off just before the bloom time. 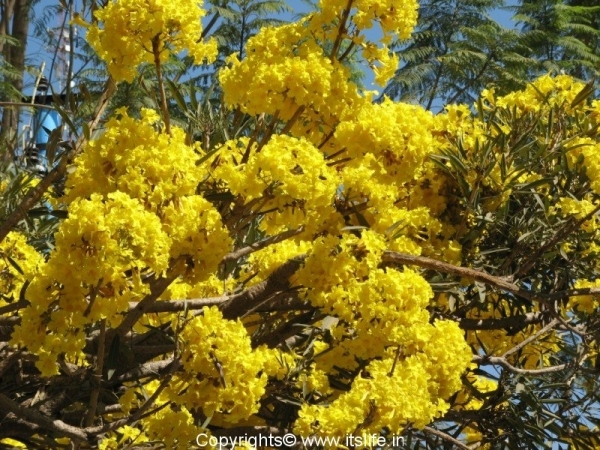 The flowers are tubular shaped, golden yellow, 2½” long, clustered at the edges of the branches. The wood of this tree is used to make furniture and outdoor stuff. Tabebuia Aurea is used as ornamental trees in gardens, along the roadside and avenues in tropical countries. Because of its magnificence and popularity, this tree is the national tree of Brazil and Venezuela. * Bignoniaceae – The Bignoniaceae, or Trumpet Creeper Family, is a family of flowering plants comprising of about 650-750 species. Members of the family are mostly trees and shrubs,and herbaceous plants in 116-120 genera. As shrubs, they are twine climbers or tendril climbers. Other common names for this family include jacaranda family, bignonia family or catalpa family. 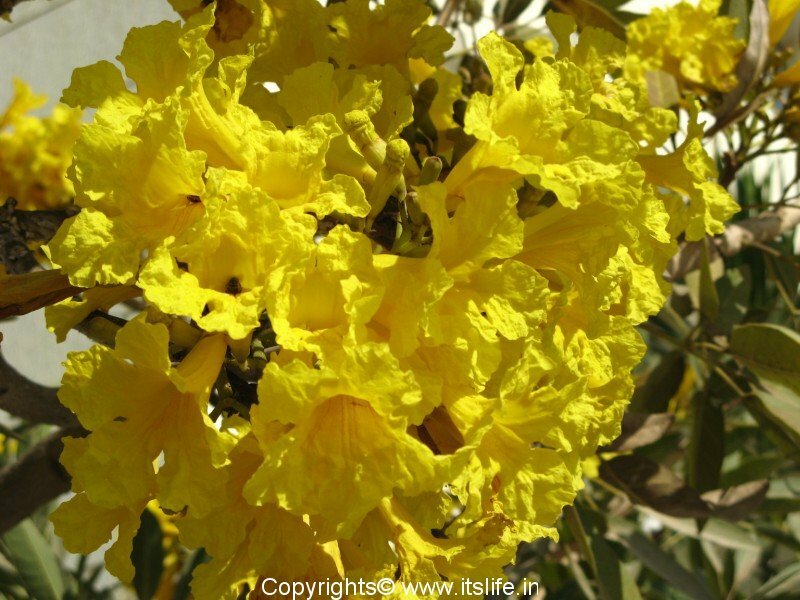 This family is commonly found as ornamental plants due to their large and often colorful flowers. Visit http://www.thatstelugu.oneindia.in for articles in Telugu. Just to point out that Tabebuia Aurea does grow and flourish in West Africa. I live in Cape Coast, Ghana and I have seen it grow. I actually planted some seeds and they have taken just 4 days to germinate. I noticed that the ones I planted in a container under a shade outside, with just enough water to keep the soil slightly moist, germinated, while the one I planted in a container under direct sunlight and watered more often, are yet to germinate. Thank you so much for sharing your experiences in growing this tree. please let me know where to parchase these trees iun banglore..
and these require any environmental conditions to grow…? and i heard ..these cause allergy if we plant inside compound.. Please inquire in Lalbagh nursery. 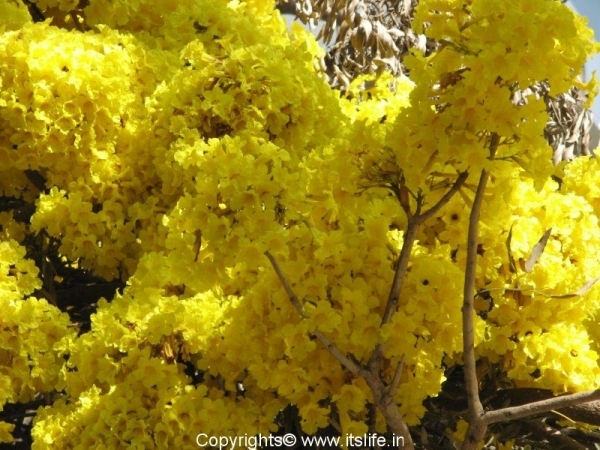 Most of the flowering frees causes pollen allergy to people who are prone to it. Thanks for sharing info about these trees. I spotted many such trees in Cambridge Layout. It’s such a beautiful sight to see it bloom.